78 years ago a brilliantly delicious Canadian treat was born. 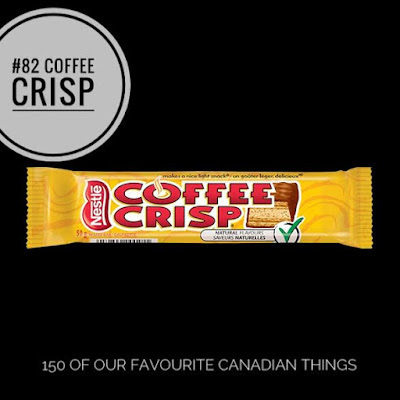 Coffee Crisp, with it's rich chocolaty taste combined with a smooth coffee flavour and crispy wafer, has been delighting Canadians since 1939. The chocolate bar originated in the UK in the 1930's named under Rowntree's Wafer Crisp. Which was later renamed Chocolate Crisp. The bar was introduced to us Canadians as Biscrisp and it had many different flavours including fruit flavours and more specifically a newly added coffee variation to make Coffee Crisp. In 1948 Coffee Crisp became one of Canada’s top candy bar products, a position it has upheld throughout the years. In the 1980's Rowntree's was taken over by Nestlé Canada, this included Rowntree's Canadian operations and the Toronto chocolate factory where the bar is made today. Sounds like she had a good job if she liked Chocolate! I've always wondered what it would be like working in a chocolate factory... Thanks for the comment Unknown!